Words of Life! Empowering Words! Every word we speak is a choice; every choice bears fruit. 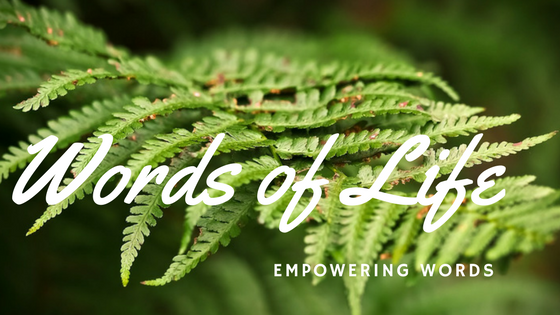 As Christians, our focused desire is to speak empowering words that consistently reap godly results. Long ago, a man was mentoring someone who was struggling to control his words. He took his student to the top of a tall tower and instructed him to rip open the feather pillow he had brought along. As directed the student held the pillow over the side of the tower, releasing its contents to the wind. “Now gather the feathers” instructed the older gentleman. Together they descended the many flights of stairs to ground level. The mentor patiently watched and waited. The younger man returned clutching ten fragile feathers in his hand. All the rest had drifted beyond sight in the gentle breeze. Once spoken words dissipate beyond return. Some words as delicate and beautiful as feathers lifting and encouraging. Other words land like lead weight on an already wounded heart. Most of these words came at a time when I felt I couldn’t, or I didn’t have what it takes for a task ahead. Sometimes, they came at a moments of complete failure. Their words were wings of grace that lifted and empowered me to continue and risk again. I cannot imagine what it would feel like to take over the leadership from someone like Moses! How overwhelming! These words would echo in Joshua’s heart repeatedly as he led millions into their promise. Moses’ confidence in him and spoken affirmation were God given! We all face situations that seem beyond our ability. Every word of affirmation makes a difference in validating and propelling us forward. My husband and I are amazed at how many young people consistently include us in their circle of friendship. Perhaps it is, in part at least, because we enjoying encouraging and inspiring them to greater and better things. This is itself is a miracle! Neither of us were always that way! As a matter of fact, we have both received a large share of hurting and condemning words. We have both had to work hard at removing anger, critical judgments and condemning attitudes from out thinking and vocabulary. Through the gospels, the words of Jesus continue to impact hearts and lives worldwide. His words were always life giving! How many or how few, of our words are spoken with intentionality of having generational influence? There is a relatively new medium called Spoken Word Poetry that has become a powerful voice of this generation. Through poetic verse the truth of redeeming love and breakthrough declares faith in Jesus Christ. Spoken, written or sung, words have the power to ignite destiny and purpose in hearts. The greatest Word is the Person of Jesus Christ! The Word came. He spoke audibly and visibly! The most important words we can speak are from The Word! They contain life beyond earth’s reach – words that give life eternal. Some of the most powerful words we could speak may easily be our testimony about what Jesus has done in our lives! What a privilege we have to tell of the things we have seen, heard and experienced. Actually, the gospels are literally testimony by four men who witnessed The Word. What has your faith meant to you? What has Christ done in your life? Have you experienced His peace or strength in difficult times? Have you witnessed a miracle? Let your voice be heard! Testify to what you have experienced! Pass on the personal experience to your children and grandchildren! Share with your friends and those in your workplace how loving and amazing God is! While they may seem insignificant, your words could be exactly what God uses to build faith in others. God has chosen the most unlikely candidates to be his witnesses: a Samaritan woman, a once demonic, murderers, thieves, and lepers. People from the highest and lowest levels of society. Our testimony of Jesus is never about us, always about Him. Since the words of my mouth have not always been pure and loving, encouraging and supportive, radiating the goodness of God, this is a constant work of progress in me. Therefore, through my writing I challenge myself, may you also be encouraged. Join me in speaking words that lift and empower! Who will you, or I, impact today with a word of life? God only knows. Never miss another blog! Join here! ← Hopelessness! Facing the Impossible!